LAGOS OCTOBER 12TH (URHOBOTODAY) – Former Governor of Delta State, Chief James Onanefe Ibori, said on Sunday that news of the death of the first civilian governor of Bayelsa State, Chief Diepreye Solomon Peter (DSP) Alamieyesiegha, hit him like a sledgehammer. Alamieyesiegha, 63, died on Saturday from a cardiac arrest at a Port Harcourt hospital following an ailment. Ibori, said that though the man had been ailing for a long time, hunted here and there by forces motivated by crass politics and personal vendetta, the deceased politician had looked as if he would be able to rise above the persecution and allow peace to pervade his life. 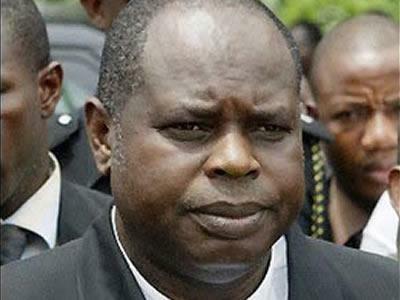 Alamieyesiegha was pardoned by President Goodluck Jonathan following his conviction for graft. Ibori said: “Alamieyesiegha was my friend, brother, and co-fighter on the Resource Control and fiscal federalism front. We were not just colleagues in the Governors Forum from 1999, in the man I found a boundless and dependable warrior in the battle for the cause of the Niger Delta. He was fearless, forthright, outspoken and dedicated his life to the causes he believed would benefit his people. Ibori who is also serving the last few months of his prison sentence in London following his guilty plea and subsequent conviction in a multi-count graft and money laundering case, further said: “Alamieyesiegha became the victim of great hypocrisy masquerading as nationalism and anti-corruption fight. “Alamieyesigha was lied against, as heaps upon heaps of untruths were piled on him, and national hysteria replaced public discourse whenever the subject was Alamieyesiegha. Otherwise respected newspapers made up stories about how he returned from London. Though the man told his own story that he was put on an aircraft and taken out from London to the Ivory Coast, his story was never investigated to even find out if he was lying. It was unconscionable journalism. He was plotted against by those who swore they were fighting on the side of good even though they had taken high seats in the devil’s court.